Having decided which direction my photography was heading, I settled into a routine of shooting for shooting’s sake in the hope getting a couple of good shots. My hard drives started to fill up and I decided that it was time to take stock again. I have long admired the work of David Ward, Joe Cornish and Charlie Waite – collectively, Light & Land – and I thought it was a good idea to go on one of their courses. The course I chose was set in the Lake District and lead by Charlie Waite. Autumn colour was late but we trekked around the Lakes to some excellent locations. I’d expected that we’d get dropped off and left to our own devices having had various potential images pointed out to us. Wrong! Each and every one of us had input from Charlie or his co-leader – sadly, his name escapes me! – suggesting little tweaks to set-up, viewpoints, exposure and so forth. Lee Filters supported Light & Land so their filters were passed around for us to experiment with. After supper every evening we had a look at some of the work we’d done, swapped ideas and much more. After five days I had learned a huge amount about landscape photography and it was time for home. I had at least one image from each days shoot that I was really satisfied with. 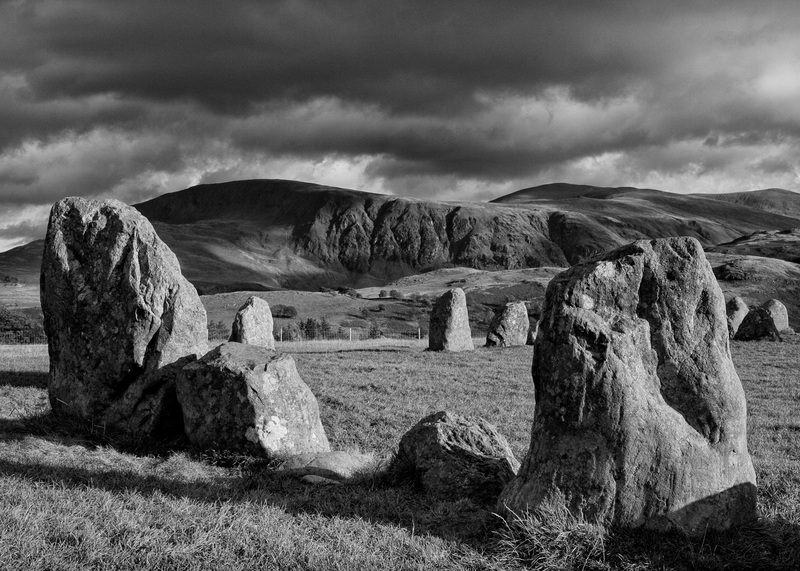 The image I’ve chosen to show from the course is from Castlerigg Stone Circle just outside Keswick. It’s another image that has evolved through many editions as my editing skills, and the tools I use, improved. This is its latest incarnation; black and white (surprise, surprise!). Taken in the late afternoon, the image was shot with my Canon gear.